Want to see the latest US Army rucksack before anyone else? This pack, MOLLE 4000, is still in the testing phase but we’ve been able to get our hands on what should be the final version. 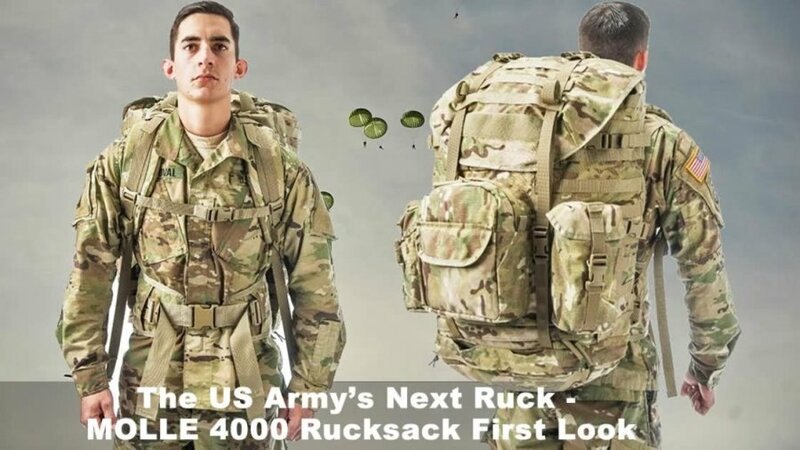 US Army to Field New MOLLE 4000 Rucksack in Late 2018 • Limited Distribution New Redesigned Modular Lightweight Load-Carrying Equipment 4000 will begin fielding later this year. Around 6,000 packs are expected to be distributed to members of the 82nd Airborne Division. Developed by U.S. Army Natick Soldier Systems Center at the behest of the 82nd Airborne Division, the MOLLE 4000 features a durable, lightweight frame; sewn-in pouches for equipment organization; a pouch for airborne equipment like a harness and lowering line; and MOLLE webbing for attaching more pouches. The design sports elements from the old ALICE (All-Purpose Lightweight Individual Carrying Equipment) pack and earlier versions of MOLLE. Rich Landry, the Individual Equipment Designer with Load Carriage Systems, Product Manager, Solider Clothing and Individual Equipment, said in a news release that— after getting feedback from the 82nd and other Army units—he determined that tweaking the weight distribution was vital. Members of the 82nd had a few additional, and more specific, requests. “One of the requirements that the 82nd had was that the harness that attaches the rucksack to the parachutist be sewn directly to the pack — because they didn’t want to lose any of the parts of it,” Landry said. “This was the one requirement we didn’t agree with. We decided it would be better and more practical if the harness that supports the pack to the parachutists harness is removable but can be set up in a configuration that is seamless in how it attaches, and therefore, doesn’t require a long rigging process. “Normally rigging a rucksack up to this type of harness can be a 5 min or longer process, depending on the Soldier. With this, it’s about a 1 min. process. But, it’s still completely removable when need be,” Landry added. The service also touts the MOLLE 4000 for its versatility; other, non-82nd units can use it as well. “The beauty is, we designed a rucksack specifically for the airborne community, however, non-airborne units can use this rucksack just as effectively by just not being issued the airborne harness components,” Landry said.